Only 5% of the world's people live in desert areas. Many live in groups or tribes and are nomads, travelling from place to place in search of: food, water and fresh grazing for their animals. Examples include the Bushman people living in the Kalahari desert and the Bedouin nomads from Arabia. trunk is used for building with. 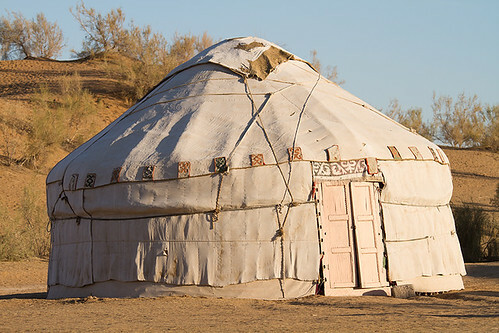 Many people live in round tents in the desert, called yurts. They are made by putting up felt and animal hides on a wooden frame. Desert people have learnt ways to help them survive in the desert climate - they know which plants contain water and wear long, loose clothing to protect them from the heat and dust.